Habitat: Brazil. Cattleya elongata species grow in full sun in Chapada da Diamantina in Bahia State and is commonly found in Serra do Sincora and in the northern region of Minas Gerais State in the Serra do Espinhaco (Espinhaco range). Plant Size: Large. Bifoliate. 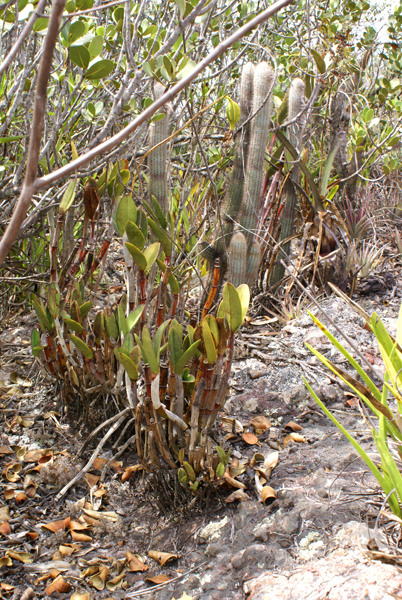 The narrow pseudobulbs of Cattleya elongata grow to 2 feet (60 cm) tall and are topped with two or three 8 to 24 inch (20 to 60 cm) long leaves. The flower spike can grow an additional twelve to eighteen inches making it the tallest of all Cattleyas. Flower Description: Fragrant. Cattleya elongata has 2 to 10 flowers per spike. The flowers are a rich coppery rose red in color with wavy sepals and petals which gleam like polished satin. The lip is white at the base with some yellow in the middle part and the mid lobe is a deep rose color. The flowers have a heavy texture and last for a long time. Color is variable. Additional Information: Grow Cattleya elongata in a well-drained. Drainage is especially important in the cooler months when the plant is not actively growing. The growing media should be open (i.e. coarse fir bark), give ample water and fertilizer when growing, and reduce water when the plant rests after flowering. This species was given this name because of its elongated flower spike. This tall rupicolous orchid blooms in late summer, fragrant.